Our sago is 34 years old and pups have been ignored. There are seven, each about 6 inches at base and clustered. I tried to dig, even saw between them to remove. They are crowded between an old Japanese tea olive that I've kept pruning back to knee high. I'm afraid I've waited too late and have to let nature take its course. Or take drastic measures and lose all. 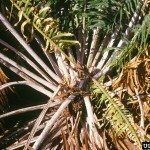 I have seen 2 sagos that have been pruned from the bottom, to about 28 inches, making them appear to be another kind of palm and they have stayed healthy. Is this possible, even if not advisable, and have you any suggestions for my dilemma?